Hematoxylin and eosin stain or haematoxylin and eosin stain (H&E stain or HE stain) is one of the principal stains in histology. 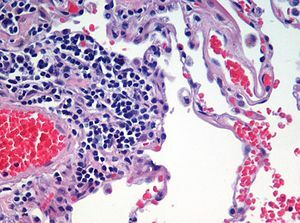 It is the most widely used stain in medical diagnosis and is often the gold standard; for example, when a pathologist looks at a biopsy of a suspected cancer, the histological section is likely to be stained with H&E. A combination of hematoxylin and eosin, it produces blues, violets, and reds. The staining method involves application of hemalum, a complex formed from aluminium ions and hematein (an oxidation product of hematoxylin). Hemalum colors nuclei of cells blue, along with a few other objects, such as keratohyalin granules and calcified material, which turns blue when exposed to alkaline water (blueing solution). The nuclear staining is followed by counterstaining with an aqueous or alcoholic solution of eosin Y, which colors eosinophilic structures in various shades of red, pink, and orange. The staining of nuclei by hemalum is ordinarily due to binding of the dye-metal complex to DNA, but nuclear staining can be obtained after extraction of DNA from tissue sections. The mechanism is different from that of nuclear staining by basic (cationic) dyes such as thionine or toluidine blue. Staining by basic dyes occurs only from solutions that are less acidic than hemalum, and it is prevented by prior chemical or enzymatic extraction of nucleic acids. There is evidence to indicate that co-ordinate bonds, similar to those that hold aluminium and hematein together, bind the hemalum complex to DNA and to carboxy groups of proteins in the nuclear chromatin. The eosinophilic structures are generally composed of intracellular or extracellular protein. The Lewy bodies and Mallory bodies are examples of eosinophilic structures. Most of the cytoplasm is eosinophilic. Red blood cells are stained intensely red. The structures do not have to be acidic or basic to be called basophilic and eosinophilic; the terminology is based on the affinity of cellular components for the dyes. Other colors, e.g. yellow and brown, can be present in the sample; they are caused by intrinsic pigments such as melanin. Some structures do not stain well. Basal laminae need to be stained by PAS stain or some silver stains, if they have to be well visible. Reticular fibers also require silver stain. Hydrophobic structures also tend to remain clear; these are usually rich in fats, e.g. adipocytes, myelin around neuron axons, and Golgi apparatus membranes. Hematoxylin is a dark blue or violet stain that is basic/positive. It binds to basophilic substances (such as DNA and RNA, which are acidic and negatively charged). DNA/RNA in the nucleus, and RNA in ribosomes in the rough endoplasmic reticulum are both acidic because the phosphate backbones of nucleic acids are negatively charged. These backbones form salts with basic dyes containing positive charges. Therefore, dyes like hematoxylin bind to DNA and RNA and stain them violet. Eosin is a red or pink stain that is acidic and negative. It binds to acidophilic substances such as positively charged amino-acid side chains (e.g. lysine, arginine). Most proteins in the cytoplasm of some cells are basic because they are positively charged due to the arginine and lysine amino-acid residues. These form salts with acid dyes containing negative charges, like eosin. Therefore, eosin binds to these amino acids/proteins and stains them pink. This includes cytoplasmic filaments in muscle cells, intracellular membranes, and extracellular fibers. ^ "Hematoxylin eosin – Histalim". Baker JR (1962) Experiments on the action of mordants. 2. Aluminium-haematein. Quart. J. Microsc. Sci. 103: 493–517. Kiernan JA (2008) Histological and Histochemical Methods: Theory and Practice. 4th ed. Bloxham, UK: Scion. Lillie RD, Pizzolato P, Donaldson PT (1976) Nuclear stains with soluble metachrome mordant lake dyes. The effect of chemical endgroup blocking reactions and the artificial introduction of acid groups into tissues. Histochemistry 49: 23–35. Llewellyn BD (2009) Nuclear staining with alum-hematoxylin. Biotech. Histochem. 84: 159–177. Marshall PN, Horobin RW (1973) The mechanism of action of "mordant" des – a study using preformed metal complexes. Histochemie 35: 361–371. Puchtler H, Meloan SN, Waldrop FS (1986) Application of current chemical concepts to metal-haematein and -brazilein stains. Histochemistry 85: 353–364. Wikimedia Commons has media related to H&E stain.